Jim Dewald is the dean of the Haskayne School of Business at the University of Calgary and an associate professor in the strategy and entrepreneurship. A business leader who can provide an effective bridge between strategy theory and on-the-ground practice, his research interests are related to the micro-foundations of strategy formulation and implementation. Specifically, his work has contributed to the constructs of cognitive resilience, entrepreneurial thinking and strategic response to disruptive innovations. Jim has three books, two book chapters, and over 50 business and academic articles to his credit. His new book, Achieving Longevity: How Great Firms Prosper Through Entrepreneurial Thinking, was published by the University of Toronto Press. Jim holds a BSc (Eng) and MBA from the University of Alberta, and a PhD from the University of Calgary. 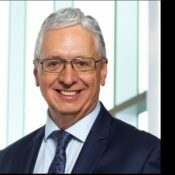 Prior to entering academe, he was active in the Calgary business community as the CEO of two major real estate development companies, an engineering consulting practice, and a tech-based real estate brokerage company. He was named Calgary Citizen of the Year and is on the boards of Boardwalk REIT, Innovate Calgary, the West Campus Development Trust, Junior Achievement Southern Alberta, CPA Alberta, and the School of Public Policy. Morris: When and why did you decide to write Achieving Longevity? Dewald: I needed to write this book because I am concerned that businesses in general, and business leaders in particular, have lost touch with the all-important entrepreneurial spirit that drove growth and prosperity in the past. Too often, business leaders put their emphasis on efficiency and commoditization rather than innovation. All too many firms have stripped away excess resources, reducing or eliminating their capacity to innovate, and weeding out the entrepreneurial skills that created the initial success. I am passionate about entrepreneurial thinking. I believe very strongly that every person, whether working for a fledgling start-up, or a multi-national corporation, or a public sector agency should be skilled in the art of entrepreneurial thinking. It is important to me that we celebrate the power of entrepreneurship in a team setting, where people combine their passion to form organizations and work collaboratively to build a sustainable difference in the lives of others. Dewald: The shocking insight for me was the realization that we have been coasting for decades on technological change that is rooted in the late 19th century. Like virtually everyone I know (and I ask this question all the time), people tend to think we live in fast changing times. But in reality, we are fiddling around the edges, and focusing more and more on efficiency or smaller, cheaper, faster ways of providing the same products and services, which is not paradigm change. Consider it this way, someone born in the 1880’s and living to the 1950’s saw shifts from horses to cars; from outhouses to central plumbing, heating, and electricity; from kerosene lamps to electric power; from pony express to telephone; from cruising the oceans to commercial jet travel. Now picture a person who also lives into their 70’s, but was born in the 1940’s. Throughout each of these dimensions, change has been refinement, not substantial change. I had never thought of this before. And to think I went down the road of speculating that entrepreneurial thinking was important because of the fast-paced change of our world, only to discover what I did, that was a revelation for me. I should also note that discovering how frequently firms exit was shocking as well. Approximately 50% of operating entities (not holding companies, but organizations with sales, employees, etc.) disappear within the first 5 years, and a further 25% in the next 10 years. I found this shocking and disturbing. Businesses are important social and economic forces in our society. Many of us rely on the stability of the business firm, and I feel longevity is a noble and important pursuit. Dewald: It is quite close to my original proposal – the only major difference is the inclusion of the discussion on our changing times. Originally I though technological change help to explain why entrepreneurship is popular right now. In fact, it seems (hard to measure) that the yearning for something new might be more a driver than trying to keep up. In some of the research we have done we tested whether innovation is driven more by necessity or opportunity. Our research found that while necessity is a powerful driver, opportunity identification is a required condition to drive change. I believe that people are looking for opportunity through their interest in understanding entrepreneurship. Morris: In your opinion, what is the most significant difference between rigid strategic planning and agile strategic entrepreneurship? This is one reason why incumbents, who generally have all the customers, suppliers, and brand power in the industry lose out when disruptive technologies and business models come into play. Agile strategic organizations are more adaptable and decentralized in their decision-making. They are not reckless, and no one manager has the ability to bet the farm, but they are listening learning organisms that are tuned to changing customer, technological, and global forces, and always seeking new ways of serving customer needs (and non-customer needs). Morris: In his latest book, The Three-Box Solution: A Strategy for Leading Innovation, Vijay Govindarajan suggests that in order to survive in a VUCA world, companies must strengthen their core business with a traditional strategy while creating future opportunities (and usually a new core business) by developing new products and/or services with entrepreneurial initiatives. Your own thoughts about VG’s observation? Dewald: We are completely aligned. I am certainly in awe of Professor Govindarajan and the clarity he brings to the challenge of trying to be a mature organization that maintains its core, but is also constantly exploring change. This is the essence of what I refer to as strategic entrepreneurship in Achieving Longevity. Possibly the one distinction the reader will see is that I feel much time has been spent on the practice of traditional strategy, and there is need for a pendulum swing to focus more on corporate entrepreneurship. Business leaders need to understand the potential of adopting the entrepreneurial thinking as a core discipline that readily recognizes and engages the entrepreneurial mind, even in the most seasoned and staid business teams and business leaders. Morris: In your opinion, how best to create and then sustain a workplace culture within which innovation is most likely to thrive? 1. Establish a clear narrative of entrepreneurial success within the firm. This demands a highly egalitarian and transparent organization in which employees feel comfortable asking the boss questions, and to make mistakes (but to learn from those mistakes). It should be completely plausible that any team member with the necessary skills and abilities can rise to the top. 2. Identify the idea generation path most suited to the organization. One such path is “bricolage” – best described as “making do with what one has” to meet a customer need. Another possible path is “effectuation” – in which entrepreneurship is driven by discoveries within the firm. One relies on bold vision, while the other on bold discovery. Each firm has its own character or DNA that can lead to a more natural reliance on one or the other (or possibly both). 3. Engage in opportunity discovery and creation processes. Discovering opportunities can be a highly planned and purposeful corporate action, or can happen by accident. Purposeful discovery is a matter of prioritizing, setting aside the always present tasks of the day, pulling together an interdisciplinary team, and giving them the encouragement and freedom to explore ways to do things differently. 4. Support middle management. To become an entrepreneurial organization, middle management need to be effective at bridging and connecting the message and direction from the top, with the actions and engagement on the front line. This requires courage, confidence, and commitment at the middle management levels – a critical element often overlooked in the implementation of organizational strategy. I want to stress that organizations are organic and uniquely distinct. There is no magic formula that will transform to an organization from stodgy to entrepreneurial, but hopefully these steps will help guide business leaders in their pursuit of longevity. But remember that success is contagious, so winning in one part of an organization can encourage others to take risks, accept failure, and engage entrepreneurial thinking. Morris: In my review of your book for various websites, I note that years ago at a GE annual meeting, its then chairman and CEO — Jack Welch — was asked to explain why he admired small companies and wanted GE to be more like them. I then quote his response. What is yours? Dewald: I really loved this quote, Bob, and was so pleased to see how you connected it with what Brett wrote, and with my main thesis. It would be laughable if it were not so sad that young firms actually can’t wait to establish the connections, resources, brainpower, and market power of large firms, only to throw it all away in the name of control, protection of the core, and “rigor”. Every large company should actively seek to be more like a small company – this should be one of their main goals, I believe. And here is the thing that should be liberating (although a bit uncomfortable) for CEO’s. the ideas do not have to, and in the best case scenario will not come from the top. An entrepreneurial culture in its truest form means ownership and dedication throughout, so everyone is looking for that next breakthrough idea. I am challenging CEO’s to replace controls and shackles with enough room to create and a set of wings. Dewald: What I discovered through research and analysis leading to this book is that this question has a very complex answer. The root of the reason is that we know, instinctively, that things are not changing at the rapid pace and that we are in need of a new drive for our economic and social systems. I know this answer is a bit ‘out there’, and it would be easy to say that corporate entrepreneurship drives short-term profitability (what mostly gets measured), but the evidence is simply not there to support this idea. Dewald: I don’t feel comfortable in making a prediction like that, and in fact my argument is generally much more of a long-term thinking approach to engaging entrepreneurial thinking. If we see new general purpose technologies, such as machine learning or transformative automation (e.g. pervasive driverless automobiles), then firms will need to be entrepreneurial to adapt. Think just of the driverless automobile and car-sharing. If we shift to no one owning a car, and car’s being ‘on call’ this is a radical shift for car manufacturers, infrastructure providers, insurers, financiers, etc. Dewald: The pitfalls and barriers to becoming entrepreneurial, or even pressing an entrepreneurial idea within a firm, are substantial. The main pitfalls include test failure or bad market research. I recall hearing a story where a major bank turned down an exclusive right to automated teller technology because market tests indicated that customers would leave the bank if it was even offered as an option. Barriers arise from the ground at regular frequency in most organizations. It is always easier to criticize and tear down new ideas that to be the brave one promoting a new way of thinking. In the book, I spend considerable time on the specific barriers corporate entrepreneurs face, and techniques to address those barriers. I group the barriers into three areas; resistance from within the organization, resistance from suppliers, and resistance from customers. Each category requires a different approach to achieve buy-in. Morris: Now I resume asking my questions. In your opinion, despite all the information, insights, and counsel that you and others provide, why do so many C-level executives have such a wide and deep “knowing-doing gap”? Dewald: For one thing, it can be very hard to make happen. True entrepreneurial cultures rely on the support of the CEO, but the actions of individual members of the organization. The answers don’t just lie with the leader – middle management and individuals at all levels need to participate, and for bureaucratic and established organizations, this can be a real challenge. Morris: Long ago, Charles Darwin observed: “It is not the most intellectual or the strongest species that survives, but the one that is able to adapt to or adjust best to the changing environment in which it finds itself.” Here’s my question. In your opinion, is entrepreneurial thinking in the C-suite today more prevalent, less prevalent, or about the same as it was (let’s say) a decade ago? Please explain. Dewald: I would love to see data on that question – what a great question. Without knowing the answer, I worry that the combination of shorter CEO tenure, huge compensation packages, and intense focus on quarterly returns might be causing CEO’s to be less and less interested in developing the ideas for longevity. Morris: How well prepared are those who receive MBA degrees today to adapt to paradigm-shifting innovation in a global marketplace that has become, at least in my opinion, more volatile, more uncertain, more complex, and more ambiguous than at any prior time that I can remember? Please explain. Dewald: I worry a lot about the preparedness of MBA graduates for the future. I know at our school they are learning more adaptive skills so they can think outside the box more readily, which I think will be important going forward. I am very encouraged by the spirit of our younger generation, who believe very firmly that business is a path for good by providing opportunities for jobs, personal growth, and dignity for people. Don’t get me wrong, they like money, but I believe they have a broader vision of how businesses can improve the world for all than what my cohort thought back in the 80’s. Morris: For more than 30 years, it has been my great pleasure as well as privilege to work closely with the owner/CEOs of hundreds of small companies, those with $20-million or less in annual sales. In your opinion, of all the material you provide in Achieving Longevity, which do you think will be of greatest value to leaders in small companies? Please explain. Dewald: I would first ask this question: “How important is longevity you?” Do they want to build a lasting legacy with their business? If the answer is yes then I would encourage them to make sure they instill mechanisms and systems to ensure the entrepreneurial spirit is always alive within their firm (along with the safeguards so no one person can bet the farm within full consideration). I have not had the exposure you have had to owner/CEO’s, but from my limited experience I see that each one of them brings unique attributes to their firm that must be at the core of their culture for the long-term. For instance, a friend of mine has an annual ‘science fair’ of sorts to allow every single employee the chance to present new ideas, many of which have gone into production. Leaders need to find their own magic and celebrate that unique magic as a traditional or ritual unique to your business. Morris: I could not agree more and presume to share my own question to a company’s leaders: “Do you want to change or do you have to change?” The longer it takes them to answer with conviction, the more likely that their change initiatives will fail. Thank you, Jim, for sharing your thoughtful and thought-provoking observations.